A long-term aim at the University Library is to ensure that the manuscript holdings adequately represent a group of poets so closely associated with the city and the university that the label applied to it is the ‘Cambridge School’. The Cambridge School is, in practice, a disputed concept: some deny its existence altogether, while many others emphasise the looseness of the connections between its members. When the term is accepted, it is usually taken to denote both a component of the British Poetry Revival of the 1960s and ‘70s, and an outpost of late modernism. What is generally accepted is that a leading light of any Cambridge School that might exist is J. H. Prynne, a writer described in The Times by Peter Ackroyd in 1987 as ‘without doubt the most formidable and accomplished poet in England today’. The Library acquired Prynne’s literary papers and correspondence in August 2016. Filling 50 metres of shelving, the collection, accessioned as MS Add.10144, includes material covering all aspects of Prynne’s poetic career, together with much relating to his work as a critic and university teacher and administrator. 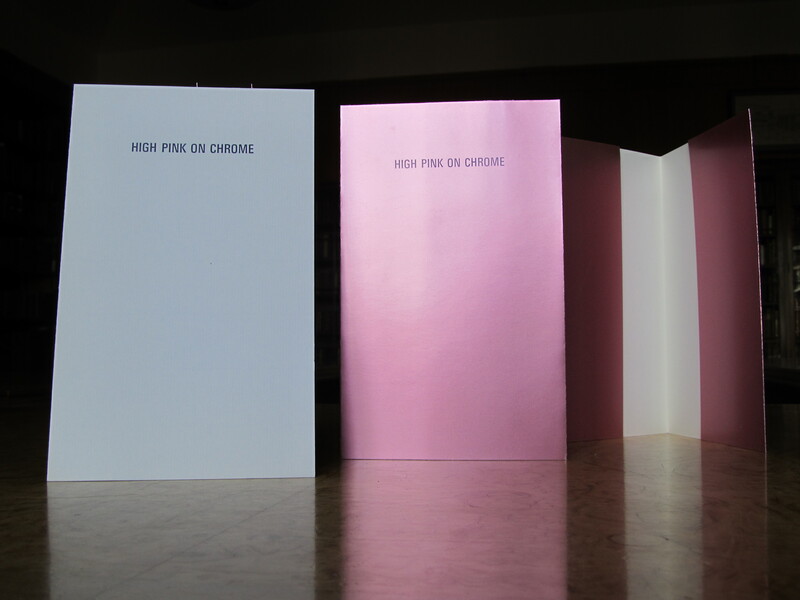 Cover proofs for Prynne’s booklet ‘High pink on chrome’, 1975. From MS Add.10144. 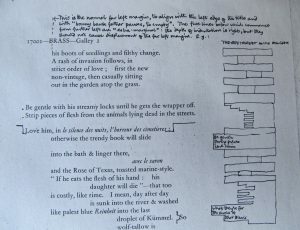 Prynne’s earliest surviving poems were preserved in sets of loose drafts and typescript fair copies, and there are several groupings corresponding to his first book, Force of Circumstance. 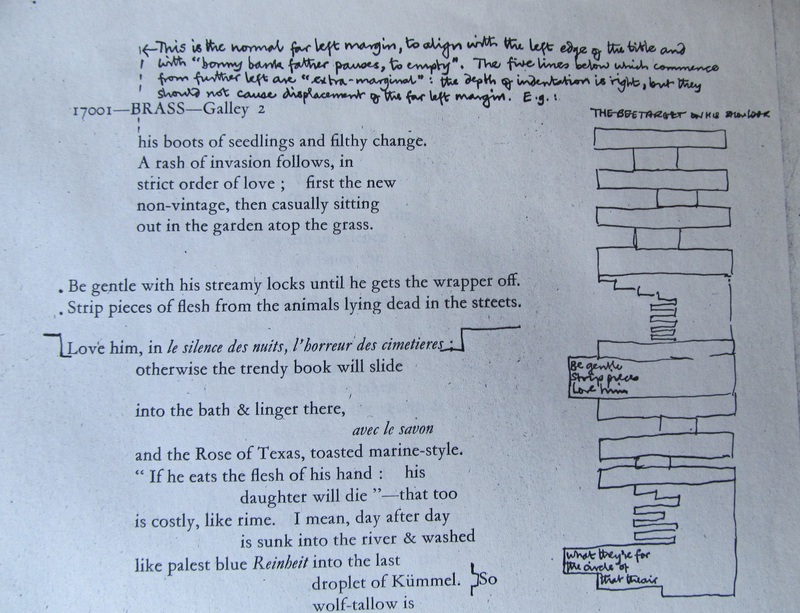 Since the mid-1960s, Prynne’s practice has been to assemble files relating both to the composition of a group or sequence of poems and its first publication in a (generally) small-scale pamphlet production. These are full of interest for researchers working on the sources and form of Prynne’s poetry, containing as they do not only autograph working drafts of the poems but contextual documents assembled by Prynne at the time of the composition of the texts, and the record of his dealings with the publishers—often fellow poets—and commercial printing firms responsible for bringing the texts to physical form on the page. At the end of the 2011 Critical Documents edition of Kazoo Dreamboats Prynne provided a set of ‘reference cues’ to the poem; researchers will be able to establish to what extent the contextual documents in these files, often consisting of notes, references and photocopies of printed texts, function as similar ‘cues’ for Prynne’s earlier works. Prynne’s distribution of his publications to friends and colleagues is recorded in ‘sendout’ lists for most of the books, documenting the social and artistic networks which formed the works’ initial readerships. Galley proofs of the Ferry Press edition of ‘Brass’, 1971, with annotations by Prynne including a diagram by relating to marginal alignments. From MS Add.10144. Prynne’s critical and academic writings extend from the essay ‘Resistance and Difficulty’ published in Prospect in 1961 and drafts of a text on Thomas Hardy and the Victorian architectural tradition also from the early 1960s, through writings on topics as diverse as Shakespeare sonnets, Willem de Kooning, Robert Creeley and E. A. Markham, to ‘The Poet’s Imaginary’, a paper delivered at the University of Sussex in 2013 and subsequently published in the Chicago Review. Various genres of writing are included in this series, including essays, papers, lectures, reviews and commentaries. The largest single series in the archive is the correspondence. It documents Prynne’s most important literary relationships, and includes exchanges commenced in the early 1960s with Charles Olson, Donald Davie, R. F. Langley and Edward Dorn; letters from fellow contributors to The English Intelligencer, including Andrew Crozier, Peter Riley and Barry MacSweeney; and a lengthy correspondence with his French translator Bernard Dubourg, in the course of which heavily-annotated texts were exchanged to and fro in numerous versions. There are also correspondences begun in the 1970s and 1980s with younger generations of writers, including Veronica Forrest-Thomson. As well as the substantial literary correspondences, letters also occur from such diverse figures as Joseph Needham, Q. D. Leavis and Francis Crick. Throughout his career, Prynne has been assiduous in preserving copies of his outgoing letters, even going so far as to photocopy postcards before despatch, and for the major series both sides of the correspondence are preserved in the archive. In many of the correspondences, the letters and cards are supplemented by verse and prose texts sent to Prynne, and there are numerous letters from him which contain detailed criticism of his correspondents’ creative work. Some correspondence is represented only sparsely in this paper archive, because many exchanges were mediated by e-mail and not printed. In addition to these three principal series, the Prynne papers also contain a great many ‘subject files’ (papers of various descriptions linked by a single theme); diaries, notebooks and commonplace books; and papers concerned with University teaching and administration. There are many papers and documents relating to Prynne’s connections with China, including his periods of residence as a teacher in various Chinese universities. Work has been going on for many months to sort and handlist the archive, and although it will be a considerable time yet before a full catalogue is completed, sufficient progress has already been made to enable access for researchers to substantial parts of the collection. Prynne has emphasised that he would like his papers to be accessible to students, readers and other writers, and the Library welcomes enquiries regarding the archive and its use.